The Great Wall of China is one of those attractions that should be on everyone’s bucket list. It truly is a remarkable architectural feat, and to see it in person is an incredible experience. 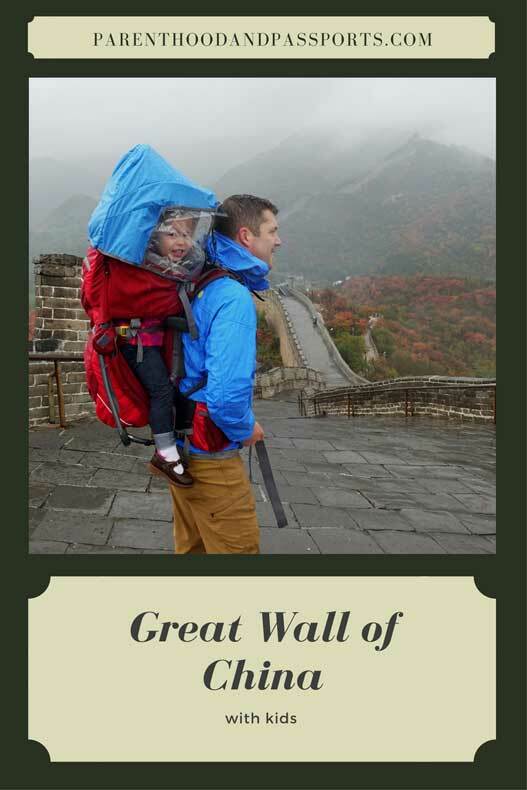 Although a bit more challenging, visiting the Great Wall of China with kids can be done, even if you are traveling with a baby or toddler. Visiting the Great Wall of China with kids can be a great experience. The Great Wall spans more than 5,500 miles. To put that in perspective, imagine if there was a wall spanning the USA from the west coast to the east coast.That would be massive, right? Now imagine if that wall continued across the entire Atlantic Ocean… in essence running from Los Angeles all the way to London. That is the approximate length of the Great Wall of China! This staggering statistic alone is enough to quantify the Great Wall as one of the Seven Wonders of the World. It took more than 2,000 years to build the Great Wall, which means there are centuries of history built into this remarkable site. There are parts of the wall that have been reconstructed while other parts are only partially standing, and still others are in ruins. We went to an area of the Great Wall known as Badaling. It is probably the most visited and usually the most crowded section of the Great Wall. The primary reason for its popularity is simply its proximity to Beijing. 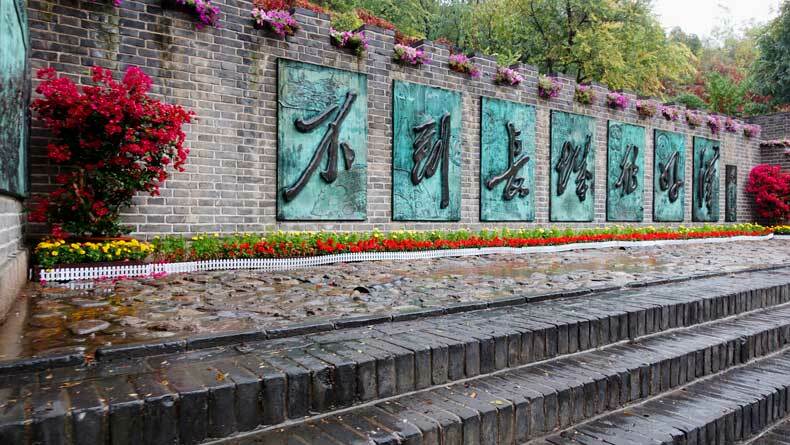 It is a convenient 1.5-2 hour drive from the center of Beijing. While it is typically crowded, we went on a cold, rainy day, so there were hardly any people beyond the first initial climb. Crowds thinned out significantly the further we walked on the wall. At times, it felt like we had the site all to ourselves. The Great Wall of China is not an easy or leisurely walk. I originally envisioned climbing a few flights of stairs and then casually strolling along a stone path that weaves through the countryside at a gradual incline. Boy, was I wrong! The Great Wall of China, at least the section we visited, is in a mountainous area. You are constantly hiking up or down at a steep incline. And by “steep” I mean ridiculously steep. 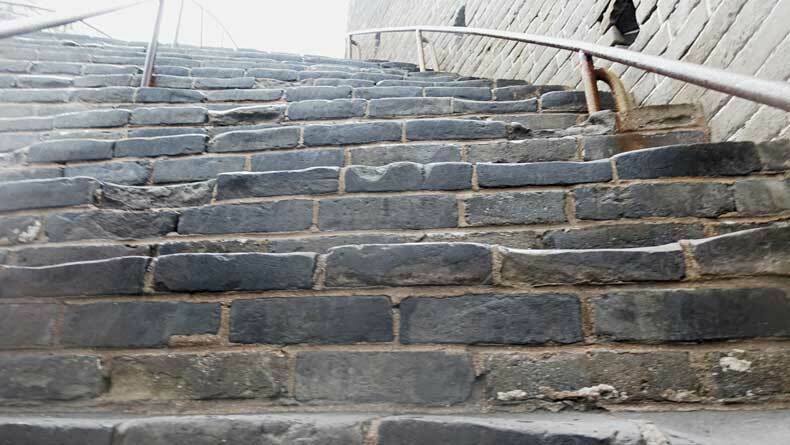 You will feel like it’s leg day at the gym during your trip to the Great Wall. The stairs are not only steep, some are taller than usual and the stones are uneven. Some of the steps were almost as high my knees. The steps can be a bit tricky and even dangerous for small children. If visiting the Great Wall of China with kids, watch them closely and make sure they hold onto the handrails. That, at least, shouldn’t be hard for them to do, considering the hand rails are about a foot high. While the steps may be built for giants, the handrails were built for toddlers. Take your time, and if possible, I recommend investing in a child carrier and wearing young children. The attraction is obviously not stroller friendly, so it’s either wear them or let them walk. Tip: I recommend this soft carrier for babies and this child carrier for toddlers. Both have been lifesavers in the last two and a half years traveling with our daughter. READ OUR FULL REVIEW OF THE DEUTER KID COMFORT CHILD CARRIER HERE. Depending on the time of year you visit and the weather, the Great Wall can be extremely crowded. Even on a rainy day in the off season we fought through the crowds at the beginning of the trek. 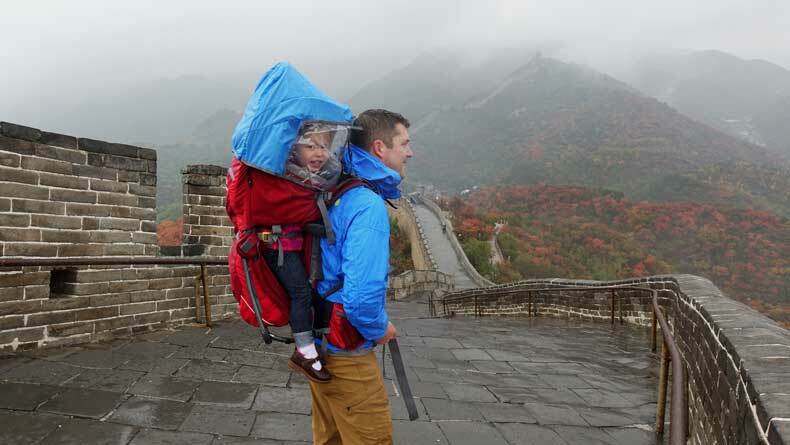 This is another reason a child carrier would be beneficial if visiting the Great Wall with small children. At the very least, I would make sure you have a child safety harness backpack with you if traveling with little ones who like to run ahead of you. We’ve already discussed the stairs and uneven stones. Depending on the section of the wall you visit there may be areas where the trek is more dangerous and challenging. Even at Badaling, a certain level of fitness is required. While visiting the Great Wall of China with kids is doable, make sure the area of the wall you are visiting is suitable for young trekkers. And be prepared for your children to get bored and tired of walking. I’ll admit my daughter wasn’t the happiest little person while we were there. She was cold and it was wet, but we were only in China for 72 hours, so we had to make the most of it, despite the weather. 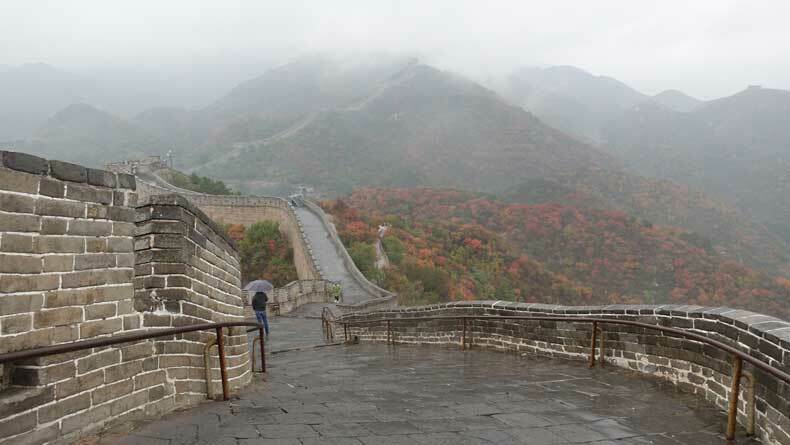 Here are few additional pointers when visiting the Great Wall of China with kids. There are bathrooms along the wall – at least there were at Badaling. I don’t expect that is the case everywhere. We did not use the bathrooms while we were there, so I cannot speak to their cleanliness. However, I would almost bet the bathrooms do not have toilet paper, as many public bathrooms in China do not. Bring your own just in case. There is also a strong possibility the toilets are squat toilets. That is something else we came across quite a bit in China. Luckily, our potty training toddler did not need to use one, but I would be prepared just in case. If you plan to visit the Great Wall of China with kids, bring some entertainment for the road trip there and back. It’s roughly a two hour drive to the wall from central Beijing, so a few travel activities or small toys will go along way. You can easily book a tour of the Great Wall of China that includes transportation. A good pair of walking shoes or hiking boots is a must when visiting the Great Wall of China with kids or without! You want a shoe with a supportive sole since you will be doing a lot of walking, but you also want something that has a good grip in the event of rain. The stone pavers can get extremely slippery when wet. 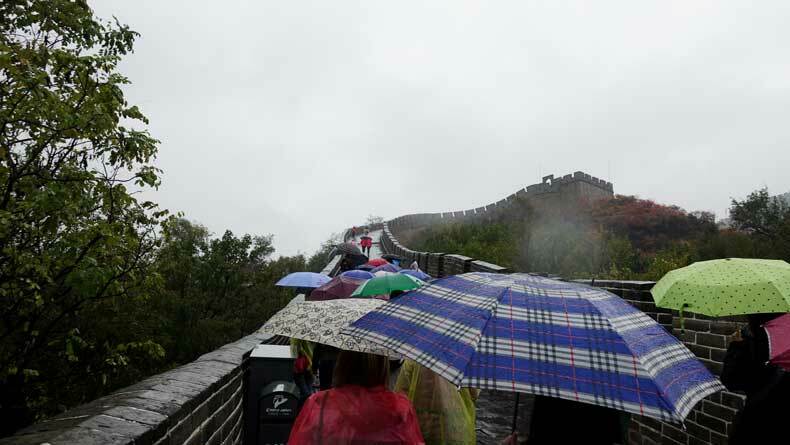 It’s easy to slip and fall if visiting the Great Wall of China in the rain. We almost slipped a couple of times ourselves. Because of the elevation, it will also be cooler at the wall than in Beijing, so you may need a lightweight jacket in spring or fall. If you get to the wall and it’s raining, they sell ponchos outside the gates. They are inexpensive and ugly, but at least you’ll stay dry. Don’t make the mistake I did. 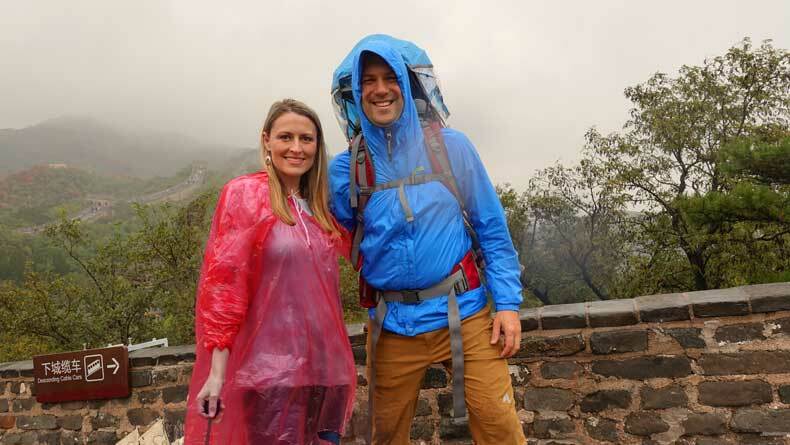 Check the weather ahead of time and bring a rain jacket if needed, otherwise you’ll be wearing a bright red trash bag in all your photos on The Great Wall of China. Admittedly, this was not my best look. There are a few restaurants and souvenir shops around Badaling where you can grab a bite to eat or have a cup of hot tea or a refreshing drink after your descent. Keep your eye out for the Chinese saying above. It is written several times on walls and sculptures in the area. The saying translates to “He who does not climb the Great Wall is not a true man.” You can get a certificate before you leave the attraction by showing your ticket to enter. This saying is inscribed on the certificate. You can also buy a souvenir photo for about 5 US dollars. You can do this inside the visitors center right before you get to the parking lot. There were no English signs identifying this area. In fact, we only knew about it because we had an interpreter with us. Still have questions about the Great Wall? Check out this short video of our walk along the world-famous tourist site. 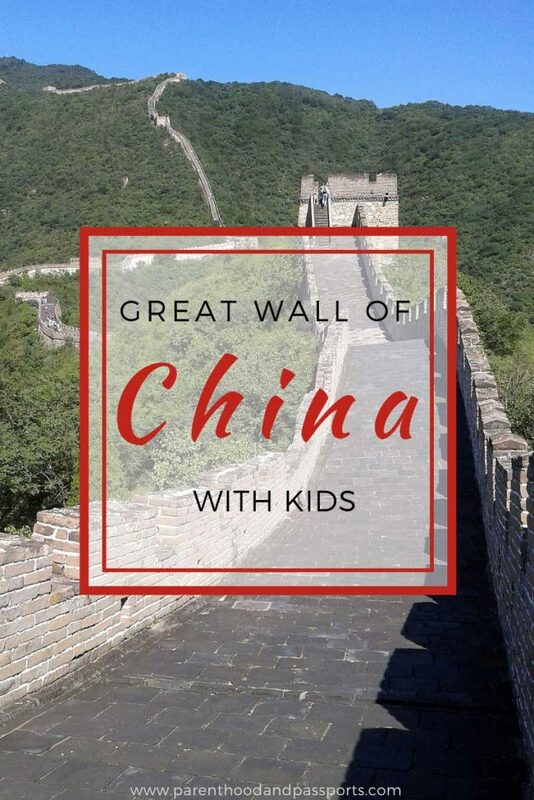 Have you been to the Great Wall of China with kids? Leave us a comment and tell us about your experience. We didn’t use a tour company. A friend of ours has family in China and they were so very kind to take us there personally. I never tried the squat toilets the entire time we were in China. I think it would be a leg workout in itself. Haha! Yes, Avery had the best end of the deal getting carried AND tucked away nice and cozy inside a rain-proof backpack. This looks like a challenging trip with a toddler! But rewarding on a rainy day to have the place almost to yourselves! This is on our list and these are great tips! You seem to have had such bad luck with the weather. But it seems like you made the best of it! We had been to China and of course on the wall years ago and the crowds were already big, but nothing in comparison to how it looks now. I have been playing with an idea of taking a city trip to Beijing with kids one day soon, so your tips are very useful. We had the WORST luck with the weather on this trip! But I guess it gives us an excuse to go back someday and try again. I love reading about other parent-travelers! So far we’ve stuck to Europe, but my brother just moved to China and we’d love to go visit one of these days. Sounds like a carrier is a must though, yikes! My first kid will probably whine but the second one will be trying to leap off the stairs for funsies. Aw! I went to the Great Wall a couple of years ago – so many steps! I was lucky it was a completely clear day, but so tiring! Thanks for sharing – it brought back some lovely memories. SOOOOO many steps! Pictures always look deceiving to me. We will definitely try to go again someday in hopes of visiting on a clear day. Great tips! Seems like this would be a but challenging with kids. Those steps look so steep! Definitely a challenge! But there is no better way to educate children than traveling and showing them the world firsthand! have been thinking of China travel for some time. Your article is very well written, enjoyed reading it. Thank you! China is definitely worth visiting. I just wish we had more time there. This is true commitment to travel! I would absolutely love to see the Great Wall of China, I didn’t realise quite how challenging it may be though! LOL. 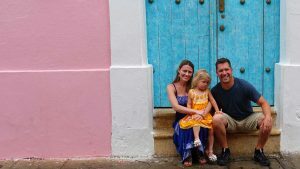 Having a kid definitely changed our traveling style, but it hasn’t stopped us from exploring even some of the more challenging places. Great tips! Just curious, how do you travel with that toddler carrier? Do you carry it on or put it in checked luggage? Also what time of year did you go? We bring it as a carry-on. Some airlines will make you gate check it, especially if overhead bins are full. Only one airline (a regional carrier in Mexico) made us check it and pay a baggage fee. We went in October.